Discussion in 'Flat Fender Tech' started by william_cj3b, Apr 1, 2017. I've decided to try this instead of mixing up a batch of 'knuckle pudding'. It's a lithium thickened EP oil marketed as cotton spindle grease. It's semi-solid at room temperature and pourable at about 130* F and clings very well. I figure it will work better than nothing or a big clump of hardened #2 stuck to the insides of the knuckles. Tractor Supply sells it locally. I have used Lubriplate 1200-2 for 45 or 50 years and never had A problem. Does anyone have an idea how many oz. of corn head grease do I need per knuckle? I don't want to under buy but don't want to buy too much either. Same as Focker. Just picked up two tubes .Takes about a tube per knuckle if I pack it in during assembly of axle.Nice and full and plenty of lube getting to that upper bearing when axle is engaged. Focker and tripilio like this. By repack you mean new seals on the back of the knuckle? 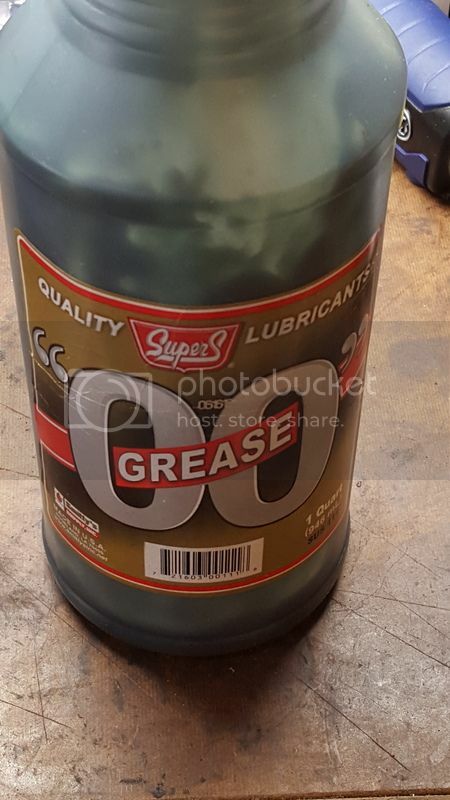 As I have read, this type of lube is used vs grease to be able to have lubrication all the time, since as it moves it gets liquified but it doesn't leak because around the seals is thicker (not moving much). Grease would sling onton the walls leaving the joint dry. My question now, after this long tirade: do I need to grease-pack the bearings for the king pin or the lube (specially the top) is enough? Pack them as you would a wheel bearing and your done. Just an FYI; in researching Corn head grease, I learned that it is a urea based grease and doesn't play well with other greases. I got a urea based grease for the bearings and then Corn head in the knuckles. That, sr makes a lot of sense! So, pack them with urea grease... final answer! I don't know if it's the FINAL answer, but it's an answer. Made sense to me to use compatible lubes. Yes , clean and repack the king pin bearings with new seals , and clean and repack the wheel bearings with new wheel seals . Is there a seal for the king pin? The seal is on the knuckle. I bought two 14oz cartridges and did fine. Mr. Focker, since I am done rebuilding (did the best I could) my front Dana 25, I am ready to move on to the knuckles. Not a big deal there. My question is this: I am trying to decide which type of lubricant to put into the knuckles. So far I favor CHG and I intend to also buy poly-urea grease for the bearings, since it does not play well with regular lubricants. The differential oil is regular 80w. If the axle seals (which are new) leak, wouldn't that be a problem? And if so, how big of a problem? Have you experienced something like it or am I overthinking it? Isn't there a seal that separates the knuckle from the outer spindle? Pretty sure that's the route the lube would have to take to reach the wheel bearings. Pretty sure there has to be something there, since the originally spec'd knuckle oil would be a mess if it went out the end of the spindle and into the wheel bearings. The outer seals will just leak onto the ground or onto the backing plates and wheels, IIRC. I was referring to the seals at the diff carrier, since this one is filled with oil. Have you experienced something like it or am I overthinking it? I haven't, but you're probably overthinking it. Any lube is better than no lube. I mix my own also. Pulled all this off my shop shelf. Does anyone know if there is a gasket to install in between the knuckle and the spindle?